never heard of such a thing , have u?? as I can never leave well enough alone, not satisfied untill everything I own is reduced to shambles, I have searched and found the man responsible for some very fast red diamonds. an authority, if u will. when I told him what I wanted to do, there was a pause on the line, during such, any number of thoughts could have been running through his head. Finally, in a slow drawl with a Lotta south in it , he said "I ain't never heard of someone doing that". as if he were talking to a retard, or a fellow from a different language. I still ain't sure if he thought me crazy, but the idea lit like fire to fuel. now I really wanna do it. especially after our conversation. especially if I'm the first damn fool to pull this off. anyone wanna buy a huge stash of ford 300 stuff??!! best educated guess on weight with factory manifolds is just under a 1000 pounds, about 800 is what a fellow who pulls with them guesses. alot less with custom manifolds. pistons are cast iron , heavy as heck. all this can be lightened. it's plausibly going in a tonner ford 4x4, should be ok on that. people's gonna flip when they hear this monster, especially with a turbo. planning ahead here is how this might work. build the turbo first, run it on an LPG Engine from a truck. when it does, ,,,tear down. dual 450 impco mixers to start. Is the picture of your Engine ?.. Your build sounds interesting, and very fun. I know Stock rebuild parts for these Engines are almost gone. Obvious that type of build would use mostly custom made parts, and be very expensive... Oh but the Fun !! Looks like a fun project I used to maintain a Black Diamond for many years. An other big six I took care of and also operated was a 1957 Diamond T Reo it had a huge 590 cu. In. Hall Scott inline six on Propane, it was very powerful more torque than many newer Diesel engines. Good luck on your big Red project. that engine belongs to a farmer in kentucky who is a foremost authority and modifier of the RD. that engine has 15 years competition never been opened up is pinched to 660 cube, snd cost, in that time about 15 k to build. I can do one for comp. to the 300 in price. which are 850 a set. really a quite cheap motor to build. I dunno if it will fit in a truck. A red diamond will fit in a mid 70's dodge. there is room, like there is room for a cummins. crew 4x4 tonner with unmarried transfer case and big axles and springs. cab is rotten so will come off to get at things. i wonder if there is a program that will build a cyber- engine , and tell me if this particular engine will work as hoped. i am sure there are programs but which and how much of the red diamond spec do i need to give it to make the program work for me? to make the engine work on the street i need to up compression or leave it as is, and turbo. need about 8 pounds boost . lighten rotating mass a lot . a competition puller tells me the pistons in a red diamond are cast iron!!! there are rods available. that are light. has SAE 2 bellhousing which is what the allison auto has behind a dmax diesel. actually this red diamond should behave just like a diesel does....except way cooler. low rpm 3500 rev limit, torque, and some HP. No, I didn't get all that far on mine before my move, so it's in real-cold storage ATM. I had my RD450 block sonic checked, and it should go 4.600 safely, from the 4.503 it is once the sleeves are dropped out. I bought a set of used BBC 4.530 flat tops that will work fine for me. An offset stroker grind to use 2.200 BBC rod bearings makes the rods the only custom bits. 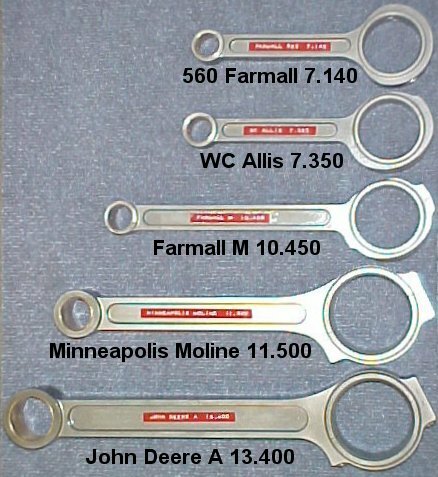 I can't recall, but think the Farmall M billet rods will work. The 501 has greater crank to cam distance, so I'm not sure how much more stroke that 660 incher has, or how much bore the 501 block takes compared to the 450. But 531ci at 4.540 x 5.500 should be enough, with a little boost? 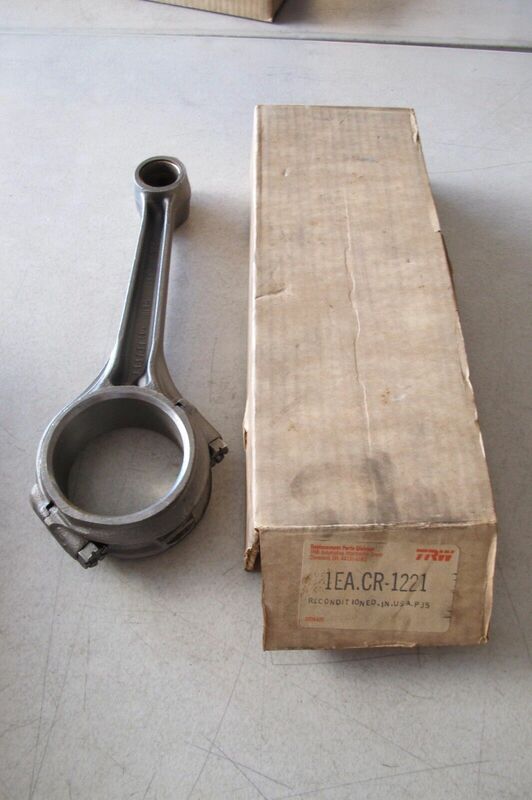 eBay listings for valves all seem to show a lot smaller than the 2.25 or so intake valves mine has. I need to re-research. Stock split exhaust manifold isn't all that heavy, and a U-bend connecting the outlets, turbo adapter on top at the heat riser flange, would make a beefy setup, and a wastegate can go in the loop below. sdiesel wrote: best educated guess on weight with factory manifolds is just under a 1000 pounds, about 800 is what a fellow who pulls with them guesses. all this can be lightened. 10-20 off the crank shouldn't be tough at all. wow, thanks for the shout!! very useful info . especially, on exhaust . the splits urge me to do a twin scroll remote turbo. so do u think this will work in a pickup.? assume a truck like I described earlier. the bell, clutch, and flywheel I can radically alter if I use a 1000 allison behind this engine. I'm assuming the mounting pads are on the bell. do u have a good guess as to weight? am I close at less than 1000? sdiesel wrote: wow, thanks for the shout!! Twin-scroll could be great, especially if you run duals from the manifolds, add an X-pipe and a cutout/shutoff on one leg, past the X so it really cranks the scroll at low speeds. I had a big VVT but sold it. Thumb over the garden hose sort of deal that spins up a big turbo faster. Remotes are ok, but between having to suction the oil return, the added plumbing for filtered air, and losing the visual of a big ole snail under the hood, I plan to keep it up front. Although, a swell extruded running board/intercooler could be useful. My plans are also for some form of truck. No reason to think it won't go in. Between a little firewall dimpling and a short front dress, no problem. The rear of the block is flat and has a fairly small area, like a 302 GMC. I plan to use a 1/2" thick aluminum C-word mid-plate and a 4L80E or an 8L90E if the budget improves drastically. A ZF 5/6 isn't out of the question if I decide I want the extra pedal. There are pads on the sides of the original bellhousing, as well as the starter mount. It should be under 1000. I think the air compressor and such were included in the oft-mentioned weights. a turbo up top makes every kinda sense. I'm going to use a vacuum pump from a 6.9 diesel, as a scavenge pump for crank case evac. Likely it will never happen this way, but it's a worthy wuestion. considering the stroke of the engine and size/weight of pistons, a vacuum seems a necessary consideration. sick six used the factory mech. fuel pump to pull from remote turbo and dumped right at the fuel pump by boring a hole in pump casing. all his stuff is kinda special and his remote turbo build is gorgeous. I use a vertical stack and low mount air filter like Isuzu cab over. sdiesel wrote: ok good . I was looking at a smog pump for evac, but think that with BBC pistons and modern rings, there shouldn't be too much blow-by. Even gapless rings are available for not much more. They are more forgiving of the larger gaps a boosted engine, and large bore require. I have a NOS Olds diesel vacuum pump, seems noisy and more power to turn than I'd like, but only messed with it on the bench. I recall the fuel pump oil return and applauded the genius. I think he's where I got my HD exhaust manifold for my 300.
the evac thing, as it's been explained and demonstrated to me creates low pre$ur below the piston allowing a smmother, quicker downward stroke. it will aid in what I fear most: lack of rapid acceleration for highway maneuvers. stomp the pedal and I get a response. to lighten like crazy and the evac were my answers to the notorious slow revver, these engines are. a 6.7 cummins is 4.88 stroke. using bbc pistons, and Rd rod, assuming I can get piston to fit, the acceleration character should not be vastly different from the 6.7??? There are always pistons going the opposite way, so not really much of an issue. Crankcase vacuum is more for ring stability in higher revving engines. Red Diamonds ain't. It may add a couple horses at the 4000 rpm or so point. A 6.7L Cummins isn't a bad comparison. A lot will depend on camshaft and turbo selection. It could cover a vast range of character. A DT466 may be more in line with the sheer mass. I plan to measure the next one I run across, but think they are not far removed from the Red gasser. Up side of that would be the availability of a billet aluminum head... Gas/E85 converted Cummins pickup engines are popping up more often. CNG/spark ignition models have been in commercial use for a while. Stock rod journals are 2.750 Lots of weight and bearing drag. Offset grinding a 450 crank will allow the extra 1/2 inch, but require custom rods. It will take several pounds off the crank, and allow several more to be removed from counterweights. I'd bet 20 could come off, maybe more, after cutting a couple pounds per piston as well. RD pistons are massively tall so even leaving the crank alone, the RD rods are too short and not very strong anyway. Rods are 9.00 long, stock with 2.4 or so pin height. 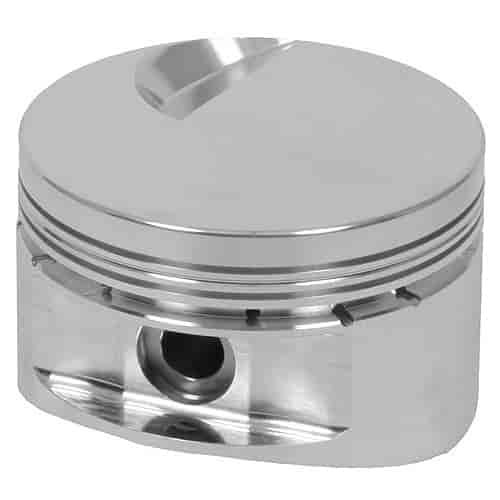 Custom pistons could be made tall enough, but the rods are weak and big ends huge. there is much to digest in ur post. but as concerns the 466....no how no way. dry weight alone girth and torque. the RD series is not vastly larger than my 300 sixes , except for that darn balancer. would sure be nice to rid myself of that. that puts me at 38" overall. read u loud and clear on evac. if I can eliminate that, all the better. but I'm keeping my scraper. with that slow spinning 6 the allison six would be the way to make up for acceleration issues? hang on, gas converted cummins??? ain't that what we're tryin to do here? I never heard o the cummins thing . must be stupid expensive. Not sure where the pics from my thread went, but next to a Chev 292, it's substantially bigger.